Good morning & welcome to another "Scrapping the little things!" 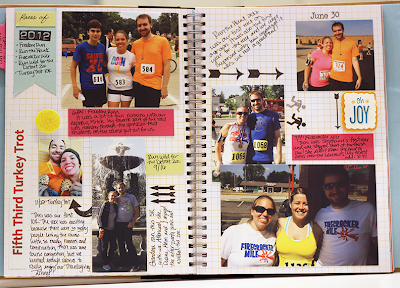 Today I did another page in my smashbook for you! I just LOVE smash booking because there are NO RULES & they are SO MUCH FUN to throw together! I explain in my video below how I put my page together! Just a few close ups! I hope you ALL enjoyed our pages today! Just a head's up, we will not be on our regular schedule this week! My team & I will be preparing for our new release happening next week! YEP, we have some AMAZING stuff in store for you so keep on a look out for more info this week right HERE! Your Smashbook page is so adorable. Your photo did come out amazing so am thrilled for you that your new toy gave you a picture better than you were expecting doesn't get any better than this. Sounds like you're in for lots of picture printing fun with it. I love playing with pictures as I load my pics into my computer and print them out all kinds of ways. I love that you share all your scrappin fun on Mondays I always look forward to this. YOU ROCKK!! You sure know how to create one awesome LO I truly adore what you did and so appreciate all the different ways you share how you use your goodies to achieve your look. I do try the different things you talk about and always proud of myself when it come out and I referring to how you use your dies to achieve certain looks. You are one amazingly talented gal and now I am so excited about your new release. So have an awesome day and enjoy your fun filled week. Another awesome page Emma! LOVE how well all your stamps and dies work together!!! More amazing DT inspiration as well!!! WOW another new release....How super EXCITING!!! Can not wait to see what you have in store for all of us!! Thanks for sharing today's project and have a GREAT Monday!!!! I love your layout, Emma! It's great! I love the layout you created, the design team's project are so amazing. I can't believe the talent and inspiration I find here. Wow!! A new release too, I know it's going to be a great one. Love the layout! Can't believe it is New Release time! Fab LO Emma...so excited to see your new release!! Gorgeous my friend, awesome page and a great photo!!! Ohhhhh how exciting - cant wait for the new release!!! Great job on your page. I like the doily sentiment, the folder journal and sequins. You and the Design Team had wonderful pages today. Oh My! I hope I find time to get more personal with the last release before another one hits. Just not enough time...how do you all do it?? Love the family pic! Super awesome page work, loving all the little touches. Oh Emma ~ your sentiment couldn't be more PERFECT with you page! What an AMAZING family photo you will treasure forever! Plus all the details are simply STUNNING! Beautiful as always!